Mercury is the closest planet to our Sun, the smallest of the eight planets, and one of the most extreme worlds in our Solar Systems. Named after the Roman messenger of the gods, the planet is one of a handful that can be viewed without the aid of a telescope. As such, it has played an active role in the mythological and astrological systems of many cultures. In spite of that, Mercury is one of the least understood planets in our Solar System. Much like Venus, its orbit between Earth and the Sun means that it can be seen at both morning and evening (but never in the middle of the night). And like Venus and the Moon, it also goes through phases; a characteristic which originally confounded astronomers, but eventually helped them to realize the true nature of the Solar System. Mercury has the most eccentric orbit of any planet in the Solar System (0.205). Because of this, its distance from the Sun varies between 46 million km (29 million mi) at its closest (perihelion) to 70 million km (43 million mi) at its farthest (aphelion). And with an average orbital velocity of 47.362 km/s (29.429 mi/s), it takes Mercury a total 87.969 Earth days to complete a single orbit. With an average rotational speed of 10.892 km/h (6.768 mph), Mercury also takes 58.646 days to complete a single rotation. This means that Mercury has a spin-orbit resonance of 3:2, which means that it completes three rotations on its axis for every two rotations around the Sun. This does not, however, mean that three days last the same as two years on Mercury. In fact, its high eccentricity and slow rotation mean that it takes 176 Earth days for the Sun to return to the same place in the sky (aka. a solar day). This means that a single day on Mercury is twice as long as a single year. Mercury also has the lowest axial tilt of any planet in the Solar System – approximately 0.027 degrees compared to Jupiter’s 3.1 degrees (the second smallest). Mercury’s core has a higher iron content than that of any other major planet in the Solar System, and several theories have been proposed to explain this. The most widely accepted theory is that Mercury was once a larger planet which was struck by a planetesimal measuring several thousand km in diameter. This impact could have then stripped away much of the original crust and mantle, leaving behind the core as a major component. Another theory is that Mercury may have formed from the solar nebula before the Sun’s energy output had stabilized. In this scenario, Mercury would have originally been twice its present mass, but would have been subjected to temperatures of 25,000 to 35,000 K (or as high as 10,000 K) as the protosun contracted. This process would have vaporized much of Mercury’s surface rock, reducing it to its current size and composition. A third hypothesis is that the solar nebula caused drag on the particles from which Mercury was accreting, which meant that lighter particles were lost and not gathered to form Mercury. Naturally, further analysis is needed before any of these theories can be confirmed or ruled out. At a glance, Mercury looks similar to the Earth’s moon. It has a dry landscape pockmarked by asteroid impact craters and ancient lava flows. Combined with extensive plains, these indicate that the planet has been geologically inactive for billions of years. However, unlike the Moon and Mars, which have significant stretches of similar geology, Mercury’s surface appears much more jumbled. Other common features include dorsa (aka. “wrinkle-ridges”), Moon-like highlands, montes (mountains), planitiae (plains), rupes (escarpments) and valles (valleys). During and following its formation 4.6 billion years ago, Mercury was heavily bombarded by comets and asteroids, and perhaps again during the Late Heavy Bombardment period. During this period of intense crater formation, the planet received impacts over its entire surface, thanks in part to the lack of any atmosphere to slow impactors down. During this time, the planet was volcanically active, and released magma would have produced the smooth plains. 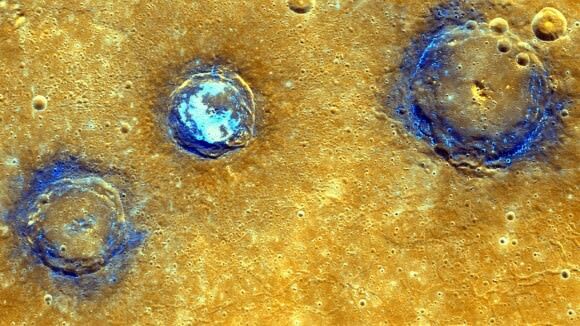 Craters on Mercury range in diameter from small bowl-shaped cavities to multi-ringed impact basins hundreds of kilometers across. The largest known crater is Caloris Basin, which measures 1,550 km in diameter. The impact that created it was so powerful that it caused lava eruptions on the other side of the planet and left a concentric ring over 2 km tall surrounding the impact crater. 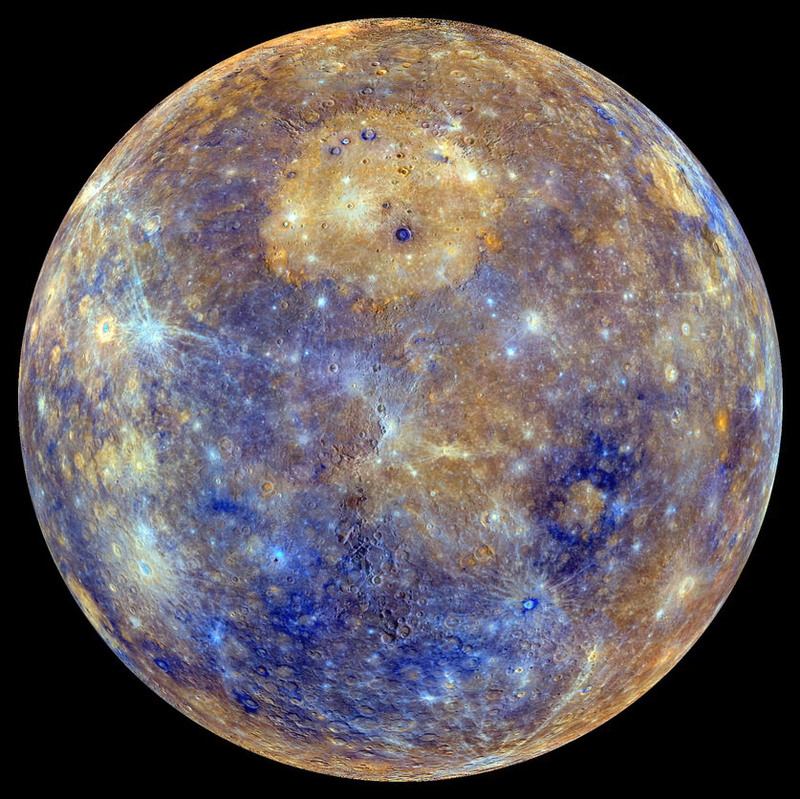 Overall, about 15 impact basins have been identified on those parts of Mercury that have been surveyed. Despite its small size and slow 59-day-long rotation, Mercury has a significant, and apparently global, magnetic field that is about 1.1% the strength of Earth’s. It is likely that this magnetic field is generated by a dynamo effect, in a manner similar to the magnetic field of Earth. This dynamo effect would result from the circulation of the planet’s iron-rich liquid core. Despite these highs in temperature, the existence of water ice and even organic molecules has been confirmed on Mercury’s surface. The floors of deep craters at the poles are never exposed to direct sunlight, and temperatures there remain below the planetary average. These icy regions are believed to contain about 1014–1015 kg of frozen water, and may be covered by a layer of regolith that inhibits sublimation. The origin of the ice on Mercury is not yet known, but the two most likely sources are from outgassing of water from the planet’s interior or deposition by the impacts of comets. Much like the other planets that are visible to the naked eye, Mercury has a long history of being observed by human astronomers. The earliest recorded observations of Mercury are believed to be from the Mul Apin tablet, a compendium of Babylonian astronomy and astrology. The observations, which were most likely made during the 14th century BCE, refer to the planet as “the jumping planet”. Other Babylonian records, which refer to the planet as “Nabu” (after the messenger to the gods in Babylonian mythology) date back to the first millennium BCE. The reason for this has to do with Mercury being the fastest-moving planet across the sky. To the ancient Greeks, Mercury was known variously as “Stilbon” (a name which means “the gleaming”), Hermaon, and Hermes. As with the Babylonians, this latter name came from the messenger of the Greek pantheon. The Romans continued this tradition, naming the planet Mercurius after the swift-footed messenger of the gods, which they equated with the Greek Hermes. In his book Planetary Hypotheses, Greco-Egyptian astronomer Ptolemy wrote about the possibility of planetary transits across the face of the Sun. For both Mercury and Venus, he suggested that no transits had been observed because the planet was either too small to see or because the transits are too infrequent. To the ancient Chinese, Mercury was known as Chen Xing (“the Hour Star”), and was associated with the direction of north and the element of water. Similarly, modern Chinese, Korean, Japanese and Vietnamese cultures refer to the planet literally as the “water star” based on the Five Elements. In Hindu mythology, the name Budha was used for Mercury – the god that was thought to preside over Wednesday. The same is true of the Germanic tribes, who associated the god Odin (or Woden) with the planet Mercury and Wednesday. The Maya may have represented Mercury as an owl – or possibly four owls, two for the morning aspect and two for the evening – that served as a messenger to the underworld. In medieval Islamic astronomy, the Andalusian astronomer Abu Ishaq Ibrahim al-Zarqali in the 11th century described Mercury’s geocentric orbit as being oval, although this insight did not influence his astronomical theory or his astronomical calculations. In the 12th century, Ibn Bajjah observed “two planets as black spots on the face of the Sun”, which was later suggested as the transit of Mercury and/or Venus. Mercury’s path across the solar disk as seen from the Solar and Heliospheric Observatory (SOHO) on November 8th, 2006. The transit was visible in eastern Europe and the eastern hemisphere. Credit: NASA. In India, the Kerala school astronomer Nilakantha Somayaji in the 15th century developed a partially heliocentric planetary model in which Mercury orbits the Sun, which in turn orbits Earth, similar to the system proposed by Tycho Brahe in the 16th century. The first observations using a telescope took place in the early 17th century by Galileo Galilei. Although he had observed phases when looking at Venus, his telescope was not powerful enough to see Mercury going through similar phases. In 1631, Pierre Gassendi made the first telescopic observations of the transit of a planet across the Sun when he saw a transit of Mercury, which had been predicted by Johannes Kepler. In 1639, Giovanni Zupi used a telescope to discover that the planet had orbital phases similar to Venus and the Moon. These observations demonstrated conclusively that Mercury orbited around the Sun, which helped to definitively prove that the Copernican Heliocentric model of the universe was the correct one. In the 1880s, Giovanni Schiaparelli mapped the planet more accurately, and suggested that Mercury’s rotational period was 88 days, the same as its orbital period due to tidal locking. The effort to map the surface of Mercury was continued by Eugenios Antoniadi, who published a book in 1934 that included both maps and his own observations. Many of the planet’s surface features, particularly the albedo features, take their names from Antoniadi’s map. In June of 1962, Soviet scientists at the USSR Academy of Sciences became first to bounce a radar signal off Mercury and receive it, which began the era of using radar to map the planet. Three years later, Americans Gordon Pettengill and R. Dyce conducted radar observations using the Arecibo Observatory’s radio telescope. Their observations demonstrated conclusively that the planet’s rotational period was about 59 days and the planet did not have a synchronous rotation (which was widely believed at the time). Ground-based optical observations did not shed much further light on Mercury, but radio astronomers using interferometry at microwave wavelengths – a technique that enables removal of the solar radiation – were able to discern physical and chemical characteristics of the subsurface layers to a depth of several meters. In 2000, high-resolution observations were conducted by the Mount Wilson Observatory which provided the first views that resolved surface features on previously unseen parts of the planet. Most of the planet has been mapped by the Arecibo radar telescope, with 5 km resolution, including polar deposits in shadowed craters of what was believed to be water ice. Prior to the first space probes flying past Mercury, many of its most fundamental morphological properties remained unknown. The first of these was NASA’s Mariner 10, which flew past the planet between 1974 and 1975. During the course of its three close approaches to the planet, it was able to capture the first close-up images of Mercury’s surface, which revealed heavily cratered terrain, giant scarps, and other surface features. Unfortunately, due to the length of Mariner 10‘s orbital period, the same face of the planet was lit at each of Mariner 10‘s close approaches. This made observation of both sides of the planet impossible, and resulted in the mapping of less than 45% of the planet’s surface. During its first close approach, instruments also detected a magnetic field, to the great surprise of planetary geologists. The second close approach was primarily used for imaging, but at the third approach, extensive magnetic data were obtained. The data revealed that the planet’s magnetic field is much like Earth’s, which deflects the solar wind around the planet. On March 24th, 1975, just eight days after its final close approach, Mariner 10 ran out of fuel, prompting its controllers to shut the probe down. Mariner 10 is thought to be still orbiting the Sun, passing close to Mercury every few months. The second NASA mission to Mercury was the MErcury Surface, Space ENvironment, GEochemistry, and Ranging (or MESSENGER) space probe. The purpose of this mission was to clear up six key issues relating to Mercury, namely – its high density, its geological history, the nature of its magnetic field, the structure of its core, whether it has ice at its poles, and where its tenuous atmosphere comes from. To this end, the probe carried imaging devices that gathered much-higher-resolution images of much more of the planet than Mariner 10, assorted spectrometers to determine abundances of elements in the crust, and magnetometers and devices to measure velocities of charged particles. Having launched from Cape Canaveral on August 3rd, 2004, it made its first fly-by of Mercury on January 14th, 2008, a second on October 6th, 2008, and a third on September 29th, 2009. Most of the hemisphere not imaged by Mariner 10 was mapped during these fly-bys. On March 18th, 2011, the probe successfully entered an elliptical orbit around the planet and began taking images by March 29th. After finishing its one-year mapping mission, it then entered a one-year extended mission that lasted until 2013. MESSENGER’s final maneuver took place on April 24th, 2015, which left it without fuel and an uncontrolled trajectory that inevitably led it to crash into Mercury’s surface on April 30th, 2015. In 2016, the European Space Agency and the Japan Aerospace and Exploration Agency (JAXA) plan to launch a joint mission called BepiColombo. This robotic space probe, which is expected to reach Mercury by 2024, will orbit Mercury with two probes: a mapper probe and a magnetosphere probe. The magnetosphere probe will be released into an elliptical orbit, then fire its chemical rockets to deposit the mapper probe into circular orbit. The mapper probe will then go on to study the planet in many different wavelengths – infrared, ultraviolet, X-ray and gamma ray – using an array of spectrometers similar to those on MESSENGER. Yes, Mercury is a planet of extremes and is riddled with contradictions. It ranges from extreme hot to extreme cold; it has a molten surface but also has water ice and organic molecules on its surface; and it has no discernible atmosphere but possessing an exosphere and magnetosphere. Combined with its proximity to the Sun, it is little wonder why we don’t know much about this terrestrial world. One can only hope that the technology exists in the future for us to get closer to this world and study its extremes more thoroughly. Is There Ice on Mercury? How Long Does it Take to Get to Mercury? Is Mercury the Hottest Planet? Nice. I’d mention that the orbital changes in Mercury were an early success in the testing of the general theory of relativity. This is different from the star-position test. 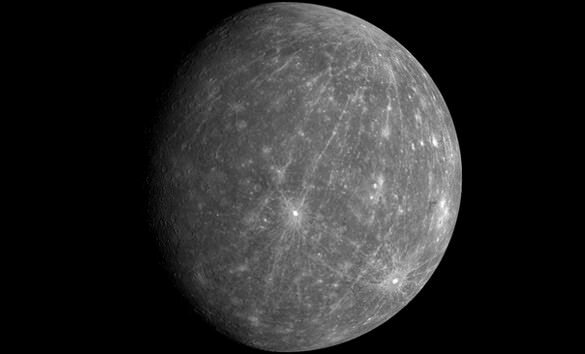 The elliptical orbit of Mercury “progresses” around the sun because of the depth of the sun’s gravity well and mercury’s different depth in that well. It’s slow but measurable and was used as a test of relativity and it worked. It doesn’t match classical physics at measurable scales. Next PostNext Could We Terraform Jupiter?